Most of the time my blogs are very shadowy and darker but lately I’ve been trying to work outside of that (funny thing with it now being October and I want to do dark themed scenes). 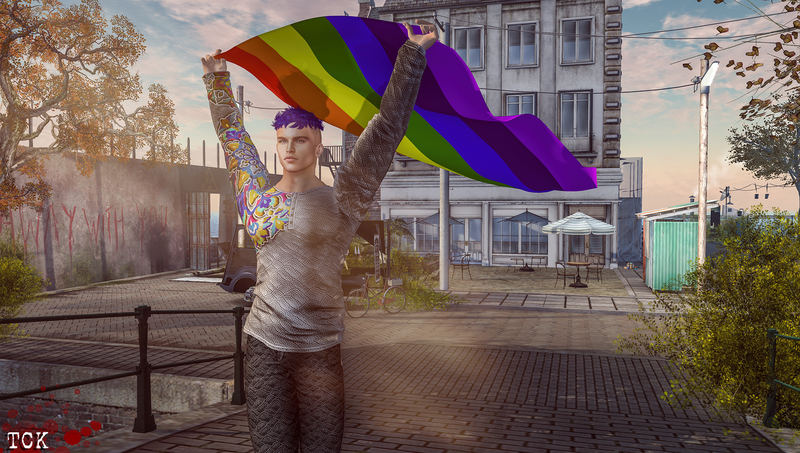 I found myself being inspired by a pose/prop from Image Essentials that is called Pride v2 because I consider myself a supporter of the LGBTQ community and know many people in the community so I feel that shining a light towards something that has seen a lot of darkness at times is a positive thing. I could repeat this until I’m blue in the face regardless of those who may not agree with my views (I don’t encourage personal conversations of religion nor politics as it tends to never turn out well) and potentially cliche as it may sound, love is love. Sometimes you find it when you are looking and also when you aren’t. It’s not always logical but when you have it in whatever form it is in front of you, embrace it no matter what. With this Image Essentials pose and prop and a colorful top provided by Bakaboo, I returned to I Am [SL] Amsterdam to find a spot at the location and it is such a wonderful and photogenic place. This is my second time visiting to set up a scene and I know that as long as it stays open I will come back again to do another photo there in the future. Being a blogger for Bakaboo is something I consider to be a privilege because the clothes are colorful and unique in a daring way. The styles that are created push the edge and I do like to take chances with things I wear (as you can’t always play it safe). I really like the “Statement” Shirt and Pants and I chose to mix and match between the three designs available for my outfit. 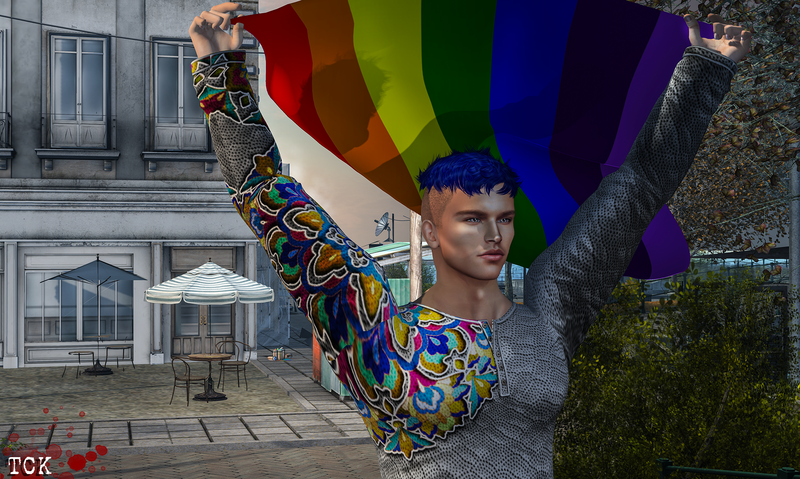 The multicolor sleeve of the top I am wearing works well with the rainbow colors of the flag I am holding to give a vibrant look to it. Within the last month or so I haven’t been able to be as creatively driven as I can be and have been in the past which I documented with having a block. 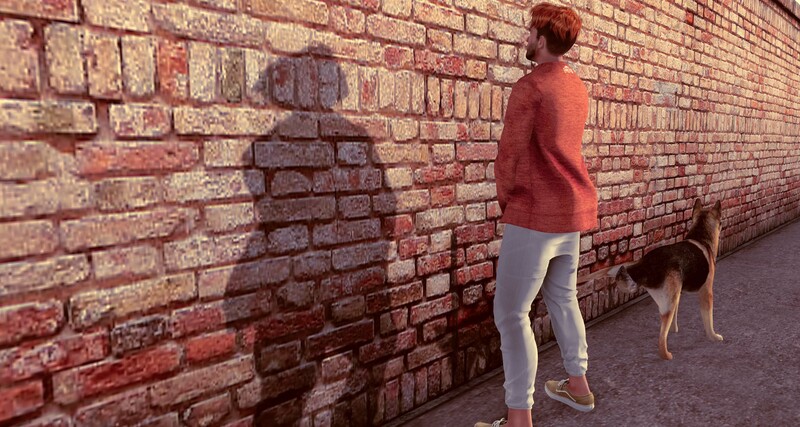 I have started to slowly work my way out of it and it’s a good time with a lot of events going such as Pose Fair and a lot of the mainstays (FaMESHed, The Men Jail, and The Men’s Department) coming with new monthly rounds. Less than a week is left for the 2018 edition of Hair Fair and there are so many great hairstyles for guys and I did pick up a few but most importantly there are two by my brand Partner, Modulus. I am gladly showing one of the two for sale. “Fraser” is a short wispy hair that can be paired with a regular or shaved hairbase and it will still look great. I’ve opted with going with a shaved one to show more depth. As one of two releases for the event and quite a few more new releases, Modulus is on a role and crushing it with each one giving us guys a variety of different ‘do’s to choose from that are of the highest quality. As I start to wrap up this blog post I want to say that lately I have been seeing a lot of positivity through social media that I feel is a breath of fresh air. It’s not hard to be negative or post super insensitive comments or status’ and bully people either virtually or in the real world. Even if it sounds like a PSA I truly believe that showing what good there is in the world is rewarding and worthwhile even if it is a challenge. There’s nothing wrong with taking the high ground even when maybe doing the opposite might be viewed as the cool or in thing with a certain group of individuals. We’re all capable of it and for anyone who believes in karma it all works out in the long term because the world benefits. In the virtual world you can have family, you can claim blood relatatives if you want and you can also call family someone you met that you have kept a great friendship for so long that the bond is strong enough that they are family. For this photo I borrowed someone I consider to be my sister and the best part is we might give each other heck with jokes but know when we get to a line and not to cross it. I’ve known Xandria for a few years now and she herself has dabbled in photos so when I asked her if she would be kind enough to sit in on a photo session (I know that I can do them myself and have the means to but just do not have the energy or mental will to do so) she was kind enough to donate a little time so that I could complete my idea and could clear it out of my headspace to give more room for other ideas that I need to work on this week. The only item that I am featuring as the pose set being used here is from Image Essentials. The “Polished” set worked well for my idea as well as the location that was passed along to me by my fellow blogger and friend, Gwen (thank you so much for telling me about this place!). Now that sims are starting to change their landscapes to autumn photos are going to take on a different look and feel and that is just how seasons go. Missing Melody has a fall ambience with many different photogenic spots at its location. 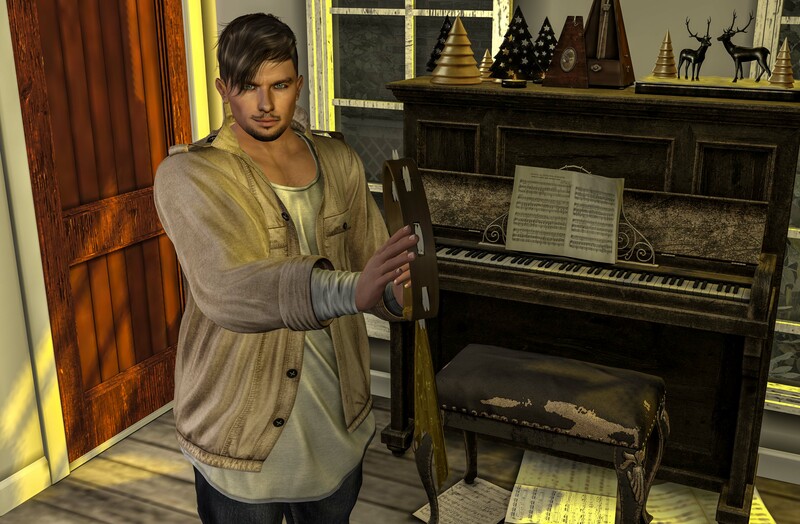 I found a really well decorated house with all the things that make houses look good (and that maybe I would use if I knew anything about good decor work in the virtual world). Xandria is also wearing something that I’m sure the gals out there might truly like (if they don’t have it already) is the newest additions to the Addams and Blueberry store as a co-released product: the “Frank” halter crop top (Addams) and jeans (Blueberry). The crowds should have died down by now so it should be very easy to get these releases and there are tons of options of single colors as well as FATPACK options for those who are into that (as I tend to be with guys items when I can).